Another quickie post for me! I think we are all pretty busy trying to get all those last minute things done! My little one did very well at the dentist but this is thanks to my middle son. He coaxed him into the chair and provided distractions. Within a few moments he was giggling and laughing with the dentist! This is a card I have made for my husband's uncle. He loves vivid color so I hope this pleases him. 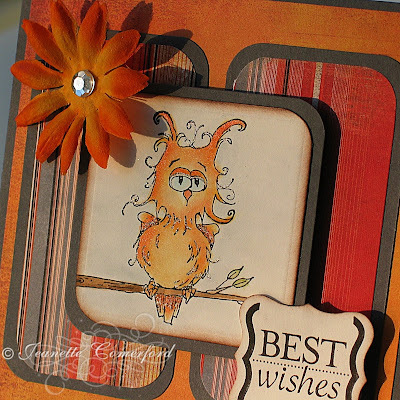 I used this cute Whimsy Owl. His expression makes me laugh. I imagine he has just woken up! You can get him here and stayed tuned because I have a few more Whimsy stamps and sentiments that I am going to ink up! And.....maybe there will be some Whimsy blog candy on the horizon so stay tuned! I used the sketch from this week's Friday Sketchers. My craft room is almost finished and I have started moving my stash in! Yippee! It will be nice to be organized again! Beautiful card Jeanette! Love the colors, so vibrant. Beautifully colored image, as always. I'm hoping for some COPICS for Christmas! :) Love your layout and accents too. Have a great day! Fabulous card Jeanette!! Great colors for a guys card!! Have a wonderful day!! 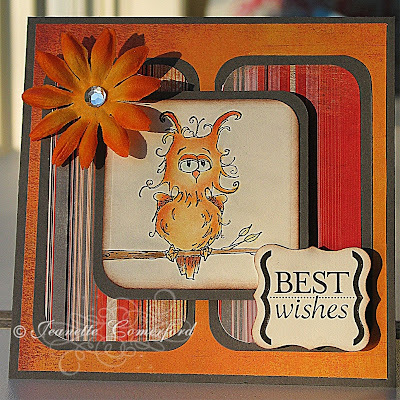 Beautiful card, Jeanette, your owl looks a little forlorn...I think he needs a cuddle lol. This layout is too good to be used just the once, bright vivid colour go so well together for a man card! What a supercute, funny image! Oh my gosh this is wicked cute!! I totally love that owl and the colors are fab! !